Structure refers to a stable configuration of substance or mei. If the substance is stable within a period of observation, it is referred to as structure. If it changes (i.e. flows) within the period of observation, it is referred to as process. Thus the difference between structure and process is in the eye of the beholder. For example, a tourist looking at a mountain regards it as a structure, while a geologist perceives it as process because it changes in the course of geological time. 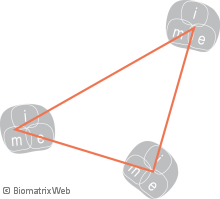 In the figure, structure is symbolised by the solid orange triangle which configures the mei dots. The triangle represents the pattern according to which the mei is configured. interaction pattern (e.g. the stable pattern of interaction between systems or their parts, like a dance between two persons, the interaction of functions within an organism or an organisation). Analogous to a riverbed facilitating the flow of water, the structure in a system facilitates the flow of mei and its interaction with other systems. Structure ensures the stability of the system and is responsible for its form. At the same time, structure prevents process to flow in any other way than that prescribed by it. Thus structure also prevents change. Changing the structure of an entity or activity system changes the form of the system and how mei (including communication and governance information) flows through the system. The transformation of a system typically also involves restructuring (besides changes in the other forces of organisation).